I got a FileNotFoundException with an error message of 'Could not load file or assembly 'LoveMoneyHttpModules' or one of its dependencies. The system cannot find the file specified.' This doesn't help much but does give some advice on enabling assembly bind failure logging. 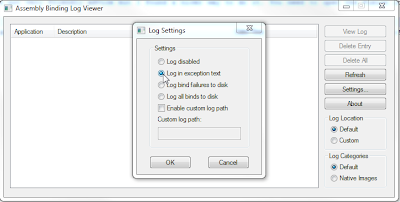 The advice is to turn on the assembly bind failure logging but gives a tip of setting the registry value [HKLM\Software\Microsoft\Fusion!EnableLog] (DWORD) to 1. That's not very friendly advice so the question is how to do that exactly. I found a nicer way to do it than messing with the registry. 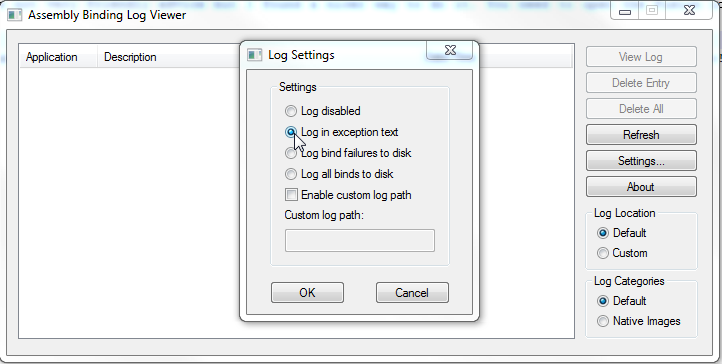 First, you need to open the Fusion Log Viewer tool. You can do this by opening a Visual Studio command prompt and running fuslogvw.exe or alternatively just type Fusion Log Viewer into your Windows search bar thing. The IIS isn't meant to be part of it I just found that it wasn't working until I tried that too. Anyway, after that I started getting logs of the attempts at binding in my yellow screen of death.